We are three friends. We are also three photographers who at times compete for the same clients.We have three ways of seeing things. You often hear ” That’s been done before. ” It is the chant and motto of the discouragement fraternity whose numbers,especially in this field, grow by the day. To the young, thank God,it falls on deaf ears. To others it resoundslike an echo in a canyon and if we pay too much attention to it, numbs us to the point of internal stagnation. 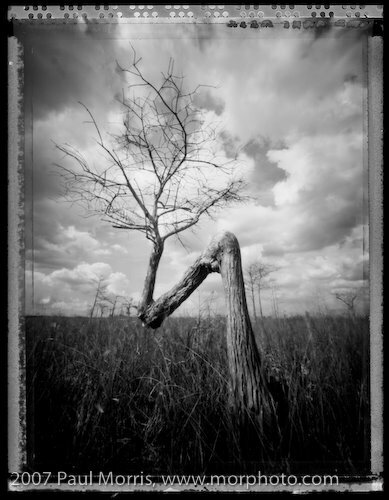 Here we three were in the Florida Everglades at a very familiar spot for locals who tread there, the “Z Tree,” a bald cypress who took a strange turn due to a force in nature. Many have stopped there and I have a host of images of this tree. Paul chose to work with his pinhole camera and Polaroid 55N film. From his view, the tree becomes part of the heavens reaching up connecting earth and sky. It was a brilliant day and through his lens, this tree celebrates it. Robert, chose to work with a Deardorff view camera scaled for 4X5 B&W film. His graphic silhouette of the tree quickly brings out the name it bears and accentuates a sense of power that gives reason to why it has endured whatever mishap fell on it. In a way it speaks for the power of nature with its resiliency of survival. I chose to work with a Canon 5D and a LensBaby. For me the tree was the main subject in a painting of an environment that exists no where else on earth. It’s warm colors muted by the len’s effect and its focus directed to the subject at hand was my interest. We could have had 50 photographers on that site that day and probably would have 50 different images produced with no two alike. Besides the beauty of the images, there are lessons here to be had. For me the lesson learned is about individuality and how, like the tree, one stands unique, despite it all. A different vision is in each one of us but it’s often blinded by the myriad of negatives that place blinders on it. Like snowflakes, no two will ever be exactly the same and that shouldn’t stop us from doing and re-doing things, with our own expression. ” That’s been done before “……maybe, but not this way.